In the right hands, broken electronics can be turned into something useful again. 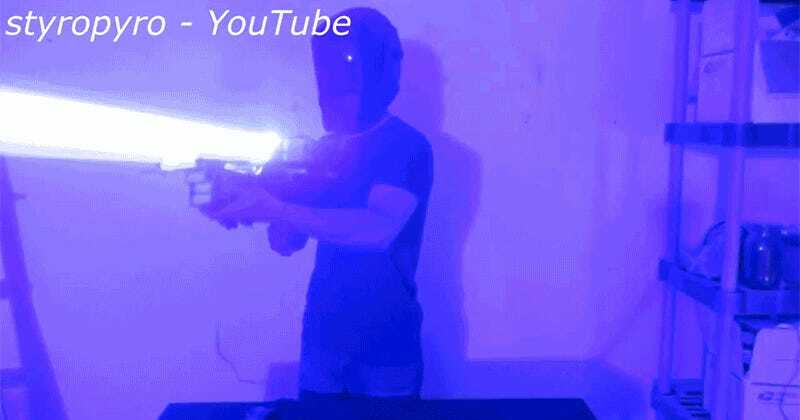 But useful isn’t the best way to describe Drake Anthony’s 200-watt laser bazooka made from a bunch of old DLP projectors he bought off eBay. Words like incredibly dangerous, do-not-try-this-at-home, or “are you crazy?” seem more appropriate. For comparison, the handheld laser pointers used during PowerPoint presentations measure in at a measly 0.005-watts, while the FDA limits the lasers that most consumers can buy to a maximum power rating of 0.5-watts. That means that Drake’s creation, which focuses four 50-watt lasers through a massive lens—is 400 times more powerful than what the FDA will let you play with. And those rules are there for a good reason. Lasers can be deadly! In mere seconds this 200-watt laser bazooka can burn through the metal housing on a tower PC and would cause severe eye damage if used without wearing a welder’s helmet.